Today's topic goes out to everyone that could care less for a sweaty stinky gym where everyone flexes in the mirror and awkwardly stares at you. I mean lets face it. It can sometimes be kind of really awkward when you're doing a workout that involves bending over, and you feel your booty burning from all the eyes!.....Or if you're like me, there are just some days when life happens and getting to the gym just isn't going to work that day. 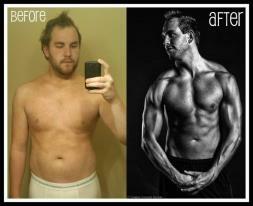 Check out his blog fitnesstobusiness.com to see his story. P90X is awesome don't get me wrong, but sometimes the reason we didn't go to the gym that day was because of time. What if you don't have time for an hour long workout? Moms.....can you really get an hour away from the little ones at home?? Problem....Solution there is a new workout coming this June (you're one of the first to know!! That's always exciting right!?) T25 is a 25minute long workout. 25 MINUTES!!!! It's going to be a high pace high intensity workout that lasts 25 minutes. I mean if you're going to workout for 25minutes it BETTER be high intensity! With working two jobs right now, I can't tell you how excited I am for this workout to come out!! Not going to lie finding time for the gym between working two jobs and moving into our home is not easy! For these type of days T25 will be perfect!! Click here for a sneak peak!!! I hope everyone had an amazing Easter weekend! We spent ours moving into our home (updated pics coming soon) and had a yummy dinner with Eric's parents, my brother and sister-in-law and their adorable kids. Have an awesome Tuesday and check out The Beach Body Challenge to see how you can transform your life like Jay did!! Let me know if you currently are using any of the above products and your thoughts on them!! I love turbo fire and chalene extreme and I used to drink shakeology. Love beach body! My sister just became a coach. Hey I am having two giveaways on my blog come check them out and enter! I've been debating trying shakeology. Did you notice a huge difference or love it? That's awesome she's a coach! It's a great way to keep yourself in tip top shape lol! !